How should I bring in my media? It would be helpful to organized your media firstly by media type; then by date, then numerically. This ordering will expedite our process and is generally how we will organize your media and deliver it back to you. What will my DVD look like? When you order a deluxe transfer, your final product will look something like this: Of course, we give you the option to choose your front cover image and text. What makes your film transfer system better? Your films are important and you want to catalogue them: We designed the world’s only online customization tool where you can preview still frames from your films and provide personalized titles and more! You want your films to be safe: We have extensive experience protecting, cleaning, and even restoring damaged film. When you get your film back it will often be in better shape than it was before we transferred it. You want the best image quality: Each frame of your film is captured individually in up to 5K resolution, eliminating the sliding motion often associated with film playback. You want a bright transfer: Your film is illuminated for capture by a low-temperature LED that prevents heat damage and provides very even lighting from edge to edge across each frame. You want the whole image: Your film is captured through an enlarged gate so that we capture slightly more than the entire frame – we miss nothing! You want to share and edit your films: We offer every output format you could want: Ready-to-play DVDs, ready-to-play Blu-rays, ready-to-play digital video (for computers, iPads, iPhones, iPods, YouTube), uncompressed video for editing, ProRes, and image sequences in either DPX, TIFF, or JPEG. We were the first in Canada to bring you full High Definition film transfer system and we are now the first to bring you the latest in 5K archival film scanning. If you are going to transfer your priceless film, why wouldn’t you transfer your 8mm , 16mm ,or 35mm film using the best system available?Contact us now for a free consultation. I want to edit the films myself? We offer a basic film transfer service for do-it-yourself people, and film students alike. We can deliver digital formats in multiple codecs and multiple resolutions. We can enhance the film or we can leave it to you. In addition we can also overscan or crop the film...your choice. How many films fit on a disc? A typical DVD holds up to 90 minutes of playback, and each reel of film (50ft of 8mm or 100ft of 16mm) is approximately just over 3 minutes. Films vary in length, but we have found that typically around 15-25 films fit on each DVD disc. It’s very common to have several DVD discs in your set, or you may prefer that we deliver them on a flash drive or external hard drive. What types of film can you transfer? Our transfer machines can handle film of almost any type of film. 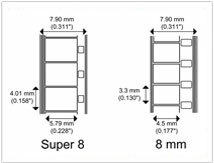 Some common names for these formats are: Regular8, 8mm, Single8, Super8, Super Duper 8, Max 8, 16mm, Super 16, Ultra-16, 35mm 3 perf or 4 perf. If you don't see the film type you need, ask us. Can you transfer the sound also? We can transfer your films with sound for all formats. 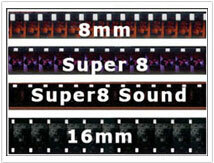 These include: Regular8, 8mm, Super8, Single8, 16mm, and 35mm. Both optical and magnetic. How can I tell what type of film I have? Movie film is defined by the width of the film from edge to edge. Common sizes came in 8mm, 16mm, and 35mm sizes. Some less common sizes were 9.5mm, 17mm and 28mm. 8mm film came as standard 8mm introduce in about 1932 and later in about 1969 Super 8mm was introduced. How do I know if my film has sound? 8mm, Super8, and 16mm came in either silent or with a soundtrack. 8mm film’s soundtrack was added to the film after the film was shot and developed. The soundtrack consisted of a spaghetti thin rust coloured magnetic strip that was glued to the film and then recorded on. This film is quite rare. 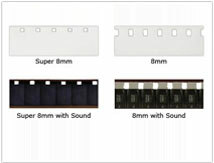 Super8 film could be bought with the magnetic strip already included on the film and various cameras were equipped with microphone jacks to allow recording directly onto the film while the film was being shot or could be dubbed later using a projector equipped with microphone jack(s). 16mm film is silent if the sprocket holes are on both sides of the film. For sound, one side of the film’s sprocket holes are replaced by the soundtrack. The sound track could be magnetic or optical. Magnetic (or Co-mag film) is generally found on film used in news gathering and this track was recorded as the film was being shot. Optical sound track is created when the film is put together (sound is recorded separately from the film media) for creating a print and this is typically found on films that were sold or distributed. What do I need to watch my videos in High Definition? Digitized High Definition videos are mastered onto Blu-ray discs. These discs are the same size, shape, and feel as DVD discs, but are different on laser level. In order to watch your videos back in High Definition, you will require a Blu-ray player. These players are backwards compatible and can play Blu-ray as well as DVD discs. What quality do I really need to transfer my videos to? Today many of our customers are digitizing their media into as high a quality as possible. The quality level depends on the media being digized. Video tapes such as VHS, Betamax, and 8mm video or Hi8 we digitize to DV codec AVI files. Other tapes such as Betacam, Umatic, DVcam, miniDV we digitize to a higher quality codec because there is more quality in the tape format. For archives, we typically use the open source codec FFV1. So, as you can see, there are options available and those options depend on a number of factors. [Just contact us] and we will guide you as to what is best for your needs. I have a whole bunch of slides, can you digitize these also? We are also equipped with a high-resolution slide-scanner! We are experienced in many transfer formats, so you can easily add any other media types, such as slides, onto your order! We have even scanned the “Viewfinder” format! What else can you transfer? IX240_Cartridge-Fuji We also digitize Advanced Photo System (APS) negatives. Also known by the brand names of IX240 (Fuiji) and Advantix (Kodak).